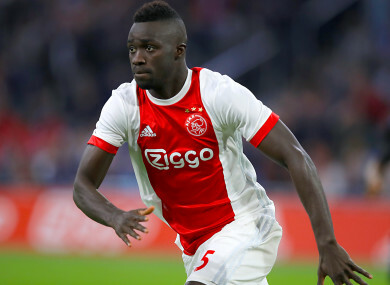 TOTTENHAM HAVE MADE their first signing of the summer transfer window and smashed their club record to bring in defender Davinson Sanchez from Ajax on a six-year deal. The 21-year-old will cost Spurs £42m once a medical has been completed and a work permit has been approved for the Colombian centre-back. Much has been made of the North London side’s lack of activity in the transfer market so far, considering they sold a first-team regular in Kyle Walker to Manchester City. But, Tottenham do have a new stadium to pay for and, last year, boss Mauricio Pochettino admitted the cost of the venue would inhibit the acquiring of new faces. Sanchez is highly-regarded, though, and has enjoyed a meteoric rise. He made his name at Medellin-based Atlético Nacional as a teenager and was a key ingredient in the side claiming the Copa Libertadores title for only the second time in their history in 2016. His performances subsequently attracted interest from Europe and he signed for Ajax for about £4.5m – the attraction of first-team football proving the motivator. He started all but two Eredivisie games in 2016/17 – an incredible feat for a youngster who had no previous experience of playing in Europe – while he proved crucial in the team’s run to the Europa League final too. He scored six times in the league and was already up-and-running this term with a goal against Nice in the Champions League qualifiers. Writing in his column in Dutch newspaper De Telegraaf earlier this year, Ruud Gullit said that Sanchez was ‘a class apart, powerful and fast-paced’. “Jaap Stam was the last Ajax defender to show such qualities”, he added. Stam only played one season for the iconic Amsterdam club before retiring and that was when he was a well-travelled, world-renowned and decorated 34-year-old. It says much about Sanchez’s reputation that he’s receiving such praise having only played one full term of European football. Email “'Best Ajax defender since Jaap Stam': Tottenham pay club record for Davinson Sanchez ”. Feedback on “'Best Ajax defender since Jaap Stam': Tottenham pay club record for Davinson Sanchez ”.